The Green Sanctuary: Pneumonia can be deadly !!! Pneumonia can be deadly !!! The alveoli are microscopic air filled sacs in the lungs responsible for gas exchange. Pneumonia can result from a variety of causes, including infection with bacteria, viruses, fungi, or parasites, and chemical or physical injury to the lungs. Its cause may also be officially described as unknown when infectious causes have been excluded. Pneumonia is common occurring in all age groups, and is a leading cause of death among the young, the old, and the chronically ill. Vaccines to prevent certain types of pneumonia are available. The prognosis depends on the type of pneumonia, the treatment, any complications, and the person's underlying health. Pneumonias can be classified in several ways. The primary system of classification is the combined clinical classification, which combines factors such as age, risk factors for certain microorganisms, the presence of underlying lung disease or systemic disease, and whether the person has recently been hospitalized. Other classifications include according to the anatomic changes that can be found in the lungs during autopsies, based on the microbial cause, and a radiological classification. Traditionally, clinicians have classified pneumonia by clinical characteristics, dividing them into "acute" (less than three weeks duration) and "chronic" pneumonias. This is useful because chronic pneumonias tend to be either non-infectious, or mycobacterial, fungal, or mixed bacterial infections caused by airway obstruction. Acute pneumonias are further divided into the classic bacterial bronchopneumonias (such as Streptococcus pneumoniae), the atypical pneumonias (such as the interstitial pneumonitis of Mycoplasma pneumoniae or Chlamydia pneumoniae), and the aspiration pneumonia syndromes. Chronic pneumonias, on the other hand, mainly include those of Nocardia, Actinomyces and Blastomyces dermatitidis, as well as the granulomatous pneumonias (Mycobacterium tuberculosis and atypical mycobacteria, Histoplasma capsulatum and Coccidioides immitis). The combined clinical classification, now the most commonly used classification scheme, attempts to identify a person's risk factors when he or she first comes to medical attention. The advantage of this classification scheme over previous systems is that it can help guide the selection of appropriate initial treatments even before the microbiologic cause of the pneumonia is known. There are two broad categories of pneumonia in this scheme: community-acquired pneumonia and hospital-acquired pneumonia. A recently introduced type of healthcare-associated pneumonia (in patients living outside the hospital who have recently been in close contact with the health care system) lies between these two categories. Community-acquired pneumonia (CAP) is infectious pneumonia in a person who has not recently been hospitalized. CAP is the most common type of pneumonia. The most common causes of CAP vary depending on a person's age, but they include Streptococcus pneumoniae, viruses, the atypical bacteria, and Haemophilus influenzae. Overall, Streptococcus pneumoniae is the most common cause of community-acquired pneumonia worldwide. Gram-negative bacteria cause CAP in certain at-risk populations. CAP is the fourth most common cause of death in the United Kingdom and the sixth in the United States. The term "walking pneumonia" has been used to describe a type of community-acquired pneumonia of less severity (because the sufferer can continue to "walk" rather than require hospitalization). Walking pneumonia is usually caused by the atypical bacterium, Mycoplasma pneumoniae. Chemical pneumonia (usually called chemical pneumonitis) is caused by chemical toxicants such as pesticides, which may enter the body by inhalation or by skin contact. When the toxic substance is an oil, the pneumonia may be called lipoid pneumonia. Necrotizing pneumonia, although overlapping with many other classifications, includes pneumonias that cause substantial necrosis of lung cells, and sometimes even lung abscess. Implicated bacteria are extremely commonly anaerobic bacteria, with or without additional facultatively anaerobic ones like Staphylococcus aureus, Klebsiella pneumoniae and Streptococcus pyogenes. Type 3 pneumococcus is uncommonly implicated. Opportunistic pneumonia includes those that frequently strike immunocompromised victims. Main pathogens are cytomegalovirus, Pneumocystis jiroveci, Mycobacterium avium-intracellulare, invasive aspergillosis, invasive candidiasis, as well as the "usual bacteria" that strike immunocompetent people as well. Double pneumonia is a historical term for acute lung injury (ALI) or acute respiratory distress syndrome (ARDS).. However, the term was, and is used still, especially by lay people, to denote pneumonia affecting both lungs. Accordingly, the term 'double pneumonia' is more likely to be used to describe bilateral pneumonia than it is ALI or ARDS. Initial descriptions of pneumonia focused on the anatomic or pathologic appearance of the lung, either by direct inspection at autopsy or by its appearance under a microscope. Multilobar pneumonia involves more than one lobe, and it often causes a more severe illness. Bronchial pneumonia affects the lungs in patches around the tubes (bronchi or bronchioles). Interstitial pneumonia involves the areas in between the alveoli, and it may be called "interstitial pneumonitis." It is more likely to be caused by viruses or by atypical bacteria. With the advent of modern microbiology, classification based upon the causative microorganism became possible. Determining which microorganism is causing an individual's pneumonia is an important step in deciding treatment type and length. Sputum cultures, blood cultures, tests on respiratory secretions, and specific blood tests are used to determine the microbiologic classification. Because such laboratory testing typically takes several days, microbiologic classification is usually not possible at the time of initial diagnosis. People with infectious pneumonia often have a cough producing greenish or yellow sputum, or phlegm and a high fever that may be accompanied by shaking chills. Shortness of breath is also common, as is pleuritic chest pain, a sharp or stabbing pain, either experienced during deep breaths or coughs or worsened by them. People with pneumonia may cough up blood, experience headaches, or develop sweaty and clammy skin. Other possible symptoms are loss of appetite, fatigue, blueness of the skin, nausea, vomiting, mood swings, and joint pains or muscle aches. Less common forms of pneumonia can cause other symptoms; for instance, pneumonia caused by Legionella may cause abdominal pain and diarrhea, while pneumonia caused by tuberculosis or Pneumocystis may cause only weight loss and night sweats. In elderly people, manifestations of pneumonia are seldom typical. They may develop a new or worsening confusion (delirium) or may experience unsteadiness, leading to falls. Infants with pneumonia may have many of the symptoms above, but in many cases they are simply sleepy or have a decreased appetite. Findings from physical examination of the lungs may be normal, but often show decreased expansion of the chest on the affected side, bronchial breathing on auscultation with a stethoscope (harsher sounds from the larger airways transmitted through the inflamed and consolidated lung), and rales (or crackles) heard over the affected area during inspiration. Percussion may be dulled over the affected lung, but increased rather than decreased vocal resonance (which distinguishes it from a pleural effusion). While these signs are relevant, they are insufficient to diagnose or rule out a pneumonia; moreover, in studies it has been shown that two doctors can arrive at different findings on the same patient. The symptoms of infectious pneumonia are caused by the invasion of the lungs by microorganisms and by the immune system's response to the infection. Although more than one hundred strains of microorganism can cause pneumonia, only a few are responsible for most cases. The most common causes of pneumonia are viruses and bacteria. Less common causes of infectious pneumonia are fungi and parasites. Viruses have been found to account for between 18—28% of pneumonia in a few limited studies. Viruses invade cells in order to reproduce. Typically, a virus reaches the lungs when airborne droplets are inhaled through the mouth and nose. Once in the lungs, the virus invades the cells lining the airways and alveoli. This invasion often leads to cell death, either when the virus directly kills the cells, or through a type of cell controlled self-destruction called apoptosis. When the immune system responds to the viral infection, even more lung damage occurs. White blood cells, mainly lymphocytes, activate certain chemical cytokines which allow fluid to leak into the alveoli. This combination of cell destruction and fluid-filled alveoli interrupts the normal transportation of oxygen into the bloodstream. As well as damaging the lungs, many viruses affect other organs and thus disrupt many body functions. Viruses can also make the body more susceptible to bacterial infections; for which reason bacterial pneumonia may complicate viral pneumonia. Viral pneumonia is commonly caused by viruses such as influenza virus, respiratory syncytial virus (RSV), adenovirus, and parainfluenza. Herpes simplex virus is a rare cause of pneumonia except in newborns. People with weakened immune systems are also at risk of pneumonia caused by cytomegalovirus (CMV). Bacteria are the most common cause of community acquired pneumonia with Streptococcus pneumoniae the most commonly isolated bacteria. Another important Gram-positive cause of pneumonia is Staphylococcus aureus, with Streptococcus agalactiae being an important cause of pneumonia in newborn babies. Gram-negative bacteria cause pneumonia less frequently than gram-positive bacteria. Some of the gram-negative bacteria that cause pneumonia include Haemophilus influenzae, Klebsiella pneumoniae, Escherichia coli, Pseudomonas aeruginosa and Moraxella catarrhalis. These bacteria often live in the stomach or intestines and may enter the lungs if vomit is inhaled. "Atypical" bacteria which cause pneumonia include Chlamydophila pneumoniae, Mycoplasma pneumoniae, and Legionella pneumophila. Idiopathic interstitial pneumonias (IIP) are a class of diffuse lung diseases. In some types of IIP, e.g. some types of usual interstitial pneumonia, the cause, indeed, is unknown or idiopathic. In some types of IIP the cause of the pneumonia is known, e.g. desquamative interstitial pneumonia is caused by smoking, and the name is a misnomer. If pneumonia is suspected on the basis of a patient's symptoms and findings from physical examination, further investigations are needed to confirm the diagnosis. Information from a chest X-ray and blood tests are helpful, and sputum cultures in some cases. The chest X-ray is typically used for diagnosis in hospitals and some clinics with X-ray facilities. However, in a community setting (general practice), pneumonia is usually diagnosed based on symptoms and physical examination alone. Diagnosing pneumonia can be difficult in some people, especially those who have other illnesses. Occasionally a chest CT scan or other tests may be needed to distinguish pneumonia from other illnesses. If antibiotics fail to improve the patient's health, or if the health care provider has concerns about the diagnosis, a culture of the person's sputum may be requested. Sputum cultures generally take at least two to three days, so they are mainly used to confirm that the infection is sensitive to an antibiotic that has already been started. A blood sample may similarly be cultured to look for bacteria in the blood. Any bacteria identified are then tested to see which antibiotics will be most effective. Vaccination is important for preventing pneumonia in both children and adults. Vaccinations against Haemophilus influenzae and Streptococcus pneumoniae in the first year of life have greatly reduced the role these bacteria play in causing pneumonia in children. Vaccinating children against Streptococcus pneumoniae has also led to a decreased incidence of these infections in adults because many adults acquire infections from children. Hib vaccine is now widely used around the globe. The childhood pneumococcal vaccine is still as of 2009 predominantly used in high-income countries, though this is changing. In 2009, Rwanda became the first low-income country to introduce pneumococcal conjugate vaccine into their national immunization program. A vaccine against Streptococcus pneumoniae is also available for adults. In the U.S., it is currently recommended for all healthy individuals older than 65 and any adults with emphysema, congestive heart failure, diabetes mellitus, cirrhosis of the liver, alcoholism, cerebrospinal fluid leaks, or those who do not have a spleen. A repeat vaccination may also be required after five or ten years. In the United States more than 80% of cases of community acquired pneumonia are treated without hospitalization. Typically, oral antibiotics, rest, fluids, and home care are sufficient for complete resolution. However, people who are having trouble breathing, with other medical problems, and the elderly may need greater care. If the symptoms get worse, the pneumonia does not improve with home treatment, or complications occur, then hospitalization may be recommended. Over the counter cough medicine has not been found to be helpful in pneumonia. Antibiotics improve outcomes in those with bacterial pneumonia. Initially antibiotic choice depends on the characteristics of the person affected such as age, underlying health, and location the infection was acquired. In the UK empiric treatment is usually with amoxicillin, erythromycin, or azithromycin for community-acquired pneumonia. In North America, where the "atypical" forms of community-acquired pneumonia are becoming more common, macrolides (such as azithromycin), and doxycycline have displaced amoxicillin as first-line outpatient treatment for community-acquired pneumonia. The use of fluoroquinolones in uncomplicated cases is discouraged due to concerns of side effects and resistance. The duration of treatment has traditionally been seven to ten days, but there is increasing evidence that short courses (three to five days) are equivalent. Antibiotics recommended for hospital-acquired pneumonia include third- and fourth-generation cephalosporins, carbapenems, fluoroquinolones, aminoglycosides, and vancomycin. These antibiotics are often given intravenously and may be used in combination. No specific treatments exist for most types of viral pneumonia including SARS coronavirus, adenovirus, hantavirus, and parainfluenza virus with the exception of influenza A and influenza B. Influenza A may be treated with rimantadine or amantadine while influenza A or B may be treated with oseltamivir or zanamivir. These are beneficial only if they are started within 48 hours of the onset of symptoms. Many strains of H5N1 influenza A, also known as avian influenza or "bird flu," have shown resistance to rimantadine and amantadine. There is no evidence to support the use of antibiotics in chemical pneumonitis without bacterial superinfection. If infection is present in aspiration pneumonia, the choice of antibiotic will depend on several factors, including the suspected causative organism and whether pneumonia was acquired in the community or developed in a hospital setting. Common options include clindamycin, a combination of a beta-lactam antibiotic and metronidazole, or an aminoglycoside. Corticosteroids are commonly used in aspiration pneumonia, but there is no evidence to support their use either. The death rate (or mortality) also depends on the underlying cause of the pneumonia. Pneumonia caused by Mycoplasma, for instance, is associated with little mortality. However, about half of the people who develop methicillin-resistant Staphylococcus aureus (MRSA) pneumonia while on a ventilator will die. In regions of the world without advanced health care systems, pneumonia is even deadlier. Limited access to clinics and hospitals, limited access to x-rays, limited antibiotic choices, and inability to treat underlying conditions inevitably leads to higher rates of death from pneumonia. For these reasons, the majority of deaths in children under five due to pneumococcal disease occur in developing coutries. Adenovirus can cause severe necrotizing pneumonia in which all or part of a lung has increased translucency radiographically, which is called Swyer-James Syndrome. Severe adenovirus pneumonia also may result in bronchiolitis obliterans, a subacute inflammatory process in which the small airways are replaced by scar tissue, resulting in a reduction in lung volume and lung compliance. Pneumonia is a common illness in all parts of the world. It is a major cause of death among all age groups and is the leading cause of death in children in low income countries. In children, many of these deaths occur in the newborn period. The World Health Organization estimates that one in three newborn infant deaths are due to pneumonia. Over two million children under five die each year worldwide and it is estimated that up to 1 million of these (vaccine preventable) deaths are caused by the bacteria Streptococcus pneumoniae, and over 90% of these deaths take place in developing countries. Mortality from pneumonia generally decreases with age until late adulthood with increased mortality in the elderly. In the United Kingdom, the annual incidence of pneumonia is approximately 6 cases for every 1000 people for the 18–39 age group. For those over 75 years of age, this rises to 75 cases for every 1000 people. Roughly 20–40% of individuals who contract pneumonia require hospital admission of which between 5–10% are admitted to a critical care unit. The mortality rate in the UK is around 5–10%. In the United States community acquired pneumonia affects 5.6 million people a year making it the 6th leading cause of death. More cases of pneumonia occur during the winter months than during other times of the year. 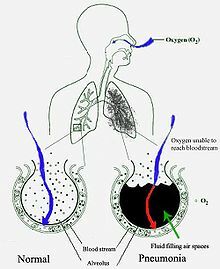 Pneumonia occurs more commonly in males than females, and more often in Blacks than Caucasians due to differences in synthesizing Vitamin D from sunlight. Individuals with underlying illnesses such as Alzheimer's disease, cystic fibrosis, emphysema, tobacco smoking, alcoholism, or immune system problems are at increased risk for pneumonia. These individuals are also more likely to have repeated episodes of pneumonia. People who are hospitalized for any reason are also at high risk for pneumonia. Peripneumonia, and pleuritic affections, are to be thus observed : If the fever be acute, and if there be pains on either side, or in both, and if expiration be if cough be present, and the sputa expectorated be of a blond or livid color, or likewise thin, frothy, and florid, or having any other character different from the common... When pneumonia is at its height, the case is beyond remedy if he is not purged, and it is bad if he has dyspnoea, and urine that is thin and acrid, and if sweats come out about the neck and head, for such sweats are bad, as proceeding from the suffocation, rales, and the violence of the disease which is obtaining the upper hand. However, Hippocrates referred to pneumonia as a disease "named by the ancients." He also reported the results of surgical drainage of empyemas. Maimonides (1138–1204 AD) observed "The basic symptoms which occur in pneumonia and which are never lacking are as follows: acute fever, sticking [pleuritic] pain in the side, short rapid breaths, serrated pulse and cough." This clinical description is quite similar to those found in modern textbooks, and it reflected the extent of medical knowledge through the Middle Ages into the 19th century. Bacteria were first seen in the airways of individuals who died from pneumonia by Edwin Klebs in 1875. Initial work identifying the two common bacterial causes Streptococcus pneumoniae and Klebsiella pneumoniae was performed by Carl Friedländer and Albert Fränkel in 1882 and 1884, respectively. Friedländer's initial work introduced the Gram stain, a fundamental laboratory test still used to identify and categorize bacteria. Christian Gram's paper describing the procedure in 1884 helped differentiate the two different bacteria and showed that pneumonia could be caused by more than one microorganism. Sir William Osler, known as "the father of modern medicine," appreciated the morbidity and mortality of pneumonia, describing it as the "captain of the men of death" in 1918, as it had overtaken tuberculosis as one of the leading causes of death in his time. (The phrase was originally coined by John Bunyan with regard to consumption, or tuberculosis). However, several key developments in the 1900s improved the outcome for those with pneumonia. With the advent of penicillin and other antibiotics, modern surgical techniques, and intensive care in the twentieth century, mortality from pneumonia, which had approached 30%, dropped precipitously in the developed world. Vaccination of infants against Haemophilus influenzae type b began in 1988 and led to a dramatic decline in cases shortly thereafter. Vaccination against Streptococcus pneumoniae in adults began in 1977 and in children began in 2000, resulting in a similar decline.